Is there any framework for UI automation testing for Unity3D? Does anyone know any framework that is compatible/integrated with Unity3D? I'm interested in Unit, Integrated and UI testing. Although I have never used them, it seems Unity released their own set of testing tools. See their introduction blogpost here. Get it from the Asset Store here. Contains both Unit and Integration tests, for the UI tests, I think you need to use an image-based-testing tool like Sikuli. I recently did my master's thesis on automated system testing of programs made with Unity. In my thesis, I evaluated some of the currently used methods and what tools can be used. I also proposed my own testing approach. You can read about it in my thesis here. In some cases bots can be used, when there is an enemy AI implemented in the game. For example in the case of the EA football game 2 bots were used for testing. They made two AI football teams fight each other. I ended up using model-based testing approach since it provides large coverage and allows generating any number of test scripts. I used TestCast MBT for modeling and generating the tests. It is a commercial tool, but I was able to model and use the framework with NModel too, which is open source (links are in the thesis). I am hoping to promote MBT for game testing and if you need any help you can send me an e-mail, which can be found in my profile. 1 Omar el Ariss, Dianxiang Xu, Santosh Dandey, Bradley Vender, Philip E. McClean, and Brian M. Slator. A systematic capture and replay strategy for testing complex GUI based java applications. 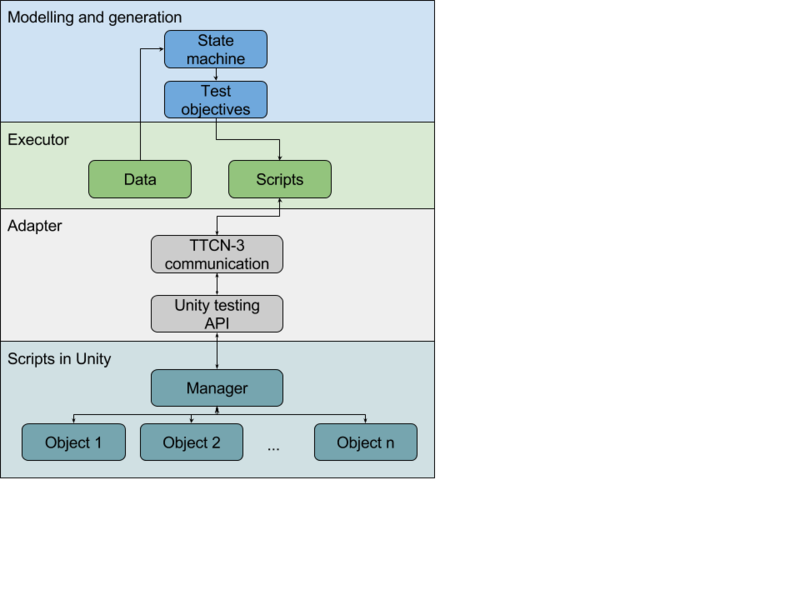 Yes, there is a UI testing framework recently released on Unity asset store It is compatible with Unity Canvas UI and can be integrated with other UI solutions here. I am working on test framework for UI testing of Unity3d application that's called Puppetry. You can find source code here and its documentation on Wiki. Puppetry can find a GameObject by its name and position in the hierarchy, and then emulate interaction with it (Click, SendKeys, DragAndDrop, Swipe, etc). Plus you can get its component to make additional validation. You can make UI testing in Editor or combine it with Appium, for example, to test the application on mobile devices. To use it on a device, Puppetry can provide screen coordinates of a GameObject, and you can click on them, or just use Puppetry's click. The framework is easy to combine with NUnit, XUnit or MSTest. Not the answer you're looking for? Browse other questions tagged automated-testing test-automation-framework unit-tests qa-developer nunit or ask your own question. What kind of testing is ApprovalTests.com doing and are there other similar frameworks? What Test Automation Product delivers management, execution and results? Which framework is best suited for full integration test?